My shoulder still hurts. I’m going to let it rest for a while longer before resuming strength training. So, I’ve been running and walking. A lot. The most remarkable result of hoofing around town has been my lower heart rate. I have a fancy Fitbit Blaze which keeps track of my heart rate. I like paying attention to this metric because it’s a direct indicator of fitness. The stronger your heart is, the more blood it can pump, so the less it has to beat. Extreme athletes have resting heart rates in the 30s while the average human is usually in the 70s. 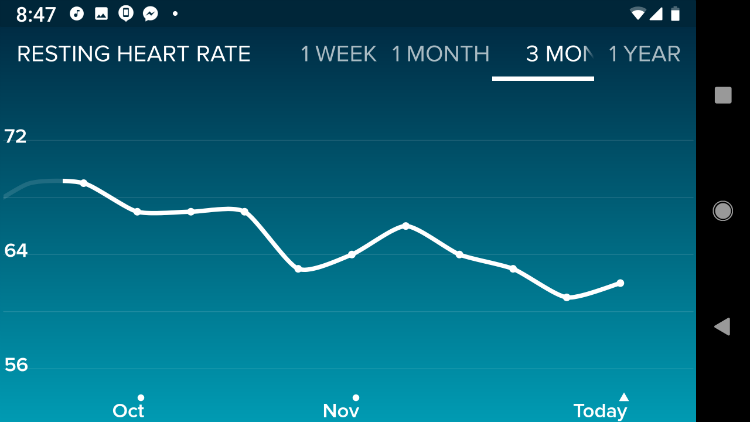 As I’ve been running, I’ve been paying attention to my resting heart rate. Last week, it went down to 58 for a day, a new all-time low for me. Yippee! While I’m sad that I’ve had to temporarily suspend my strength training, I’m happy to see that I’m getting in better cardio health. I’m debating whether or not to set a step goal in 2019. I think that speed-walking has helped with weight loss, but wandering around town for hours on end isn’t the most productive use of time. Perhaps I could achieve the same weight loss with high intensity interval training? That or just less damn beer. Mrs. 1500 and I both need to focus on our health in the new year. All of the money in the world doesn’t mean a thing if you’re in poor health. The great thing about FI life is that you get the time to work on yourself. May: We’ll be running a half-marathon as well. We’re still trying to figure out which one. July: We’ll ride RAGBRAI which is a bicycle ride across Iowa. It’s more fun that it sounds! If the mood strikes you, join us for one of these events! You crazy kids teaming up with the POPs for Berkshire and the house and such? Really happy to hear you guys make a shift towards better health and fitness, that was a huge part of my 2018 and I’m in such a better place because of it. How about we join you on all 3??? And then some. I might have missed it, but have you seen a physical therapist about your shoulder? As someone who had an 85% tear in my rotator cuff, this was the fist place the Dr sent me. They did a great job getting my range of motion back (strength no, because the tear was just too bad). In the end I had to have surgery, but the PTs got me back to where I needed to be and ahead of schedule. They might be able to give you some simple stretches and resistance band exercises to strength what is weak. It might also keep you from losing some of the gains from your previous strength training overall. Bike ride across iowa actually sounds very nice (in the summer, not so much in the winter). Hopefully I may make it to the century ride here, there’s one in Haleiwa, and it stretches through north shore, so will have some very awesome views. Unfortunately, my only operating bike is an electric bike, which may or may not be permitted. We’ll see. 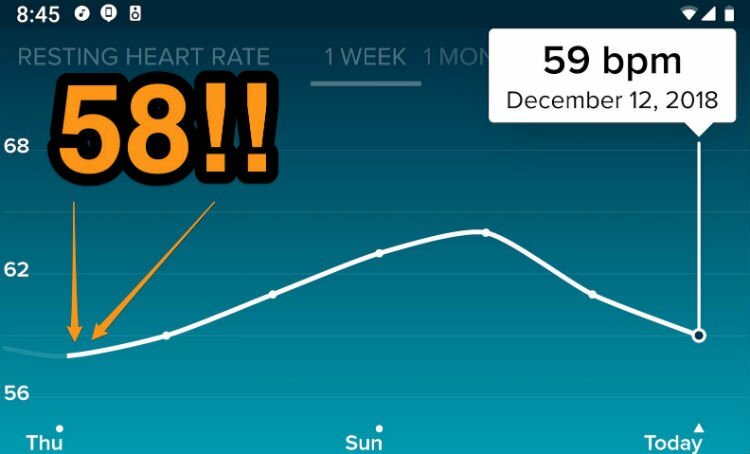 Last week I had a colonoscopy and I sent the nurses into a panic on multiple occasions as I set off heart rate alarms as my resting heart rate was very low. My wife kept telling them that it is normal as he is an endurance athlete. It didn’t go over well. They finally kicked me out of the recovery area.